‘I have a knack for doing wrong,’ confesses Swiss-Chocolate factory owner Mika Muller (Isabelle Huppert), the praline beauty in Claude Chabrol’s detective-style thriller. Chabrol wanted to make a film about ‘Evil’, chose Huppert as its purveyor, and from the opening scene Mika is a twisted queen. Mika has just married André Polonski (Jacques Dutronc) a pianist whose first wife, Lisbeth, died in a car accident. The exact cause of her death is unclear. While André sits at the piano in their bourgeois abode, lost in music, Mika manages ‘Muller’ chocolates and is eerily pleasant to people, offering help with a pinched control: ‘I believe everyone needs help’ she quips to the mother of Jeanne (Anna Mouglalis). Jeanne is also a gifted pianist, and due to a possible mix up on the maternity ward at birth, there is a suggestion that she may be Polonski’s daughter. Chabrol eschews the presence of a detective, leaving Jeanne to sniff out the truth about Lisbeth’s death. When Jeanne comes to stay in the Polonski home to work with André, she observes Mika accidentally spilling chocolate from a flask. She is immediately suspicious, and begins to question the cause of Lisbeth’s death. Mika is no Willy Wonka and Chabrol demonstrates this with comedy as bitter as her chocolate. Smiles are fixed, stubborn, reflecting her resistance to the Muller factory donating money to local children’s projects; instead, Mika prefers to sponsor twelve adult pain-relief centres. Just before ‘accidently’ spilling boiling water on her stepson’s foot, Mika beams ‘I want everyone to be happy.’ Then, as she applies the bandage: ‘I wanted to be a nurse once.’ And, of course, it’s always Mika who makes and serves the family’s hot chocolate, gliding around the kitchen and living room with the ease of a witch familiar with her spell. Mika is fairytale evil, yet desperate to always say the right thing. Her existence is fed by a drip of her own melancholy and an inability to properly connect with people. Huppert’s face displays this paradox with moving eloquence. Crisp politeness is delivered with a high chin and eyes fixed on a distant mountain, one that’s home to criminal behaviour over which she has no control. She moves on: ‘I have real power in my mind. 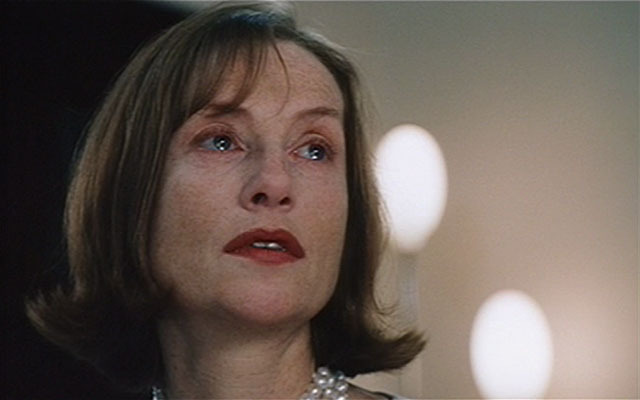 I calculate everything.’ Her confession sums up the power in Mika’s madness, and also, perhaps, the energy and control that make Huppert and Chabrol’s masterful collaborations such a disturbing pleasure. This entry was posted in Claude Chabrol, French Cinema, French Film, Merci Pour le Chocolat, Thriller and tagged Anna Mouglalis, Auteur, Catholicism, Chabrol's confessions, Childhood repression, Claude Chabrol, Detective genre, Evil personified, Fairytale evil, French Cinema, French Film, French film review, Isabelle Huppert, Jacques Dutronc, Merci Pour Le Chocolat, Movies with pianists, Rodolphe Pauly, Swiss chocolate in the movies, Thriller. Bookmark the permalink. You nailed it one of my favorite director.